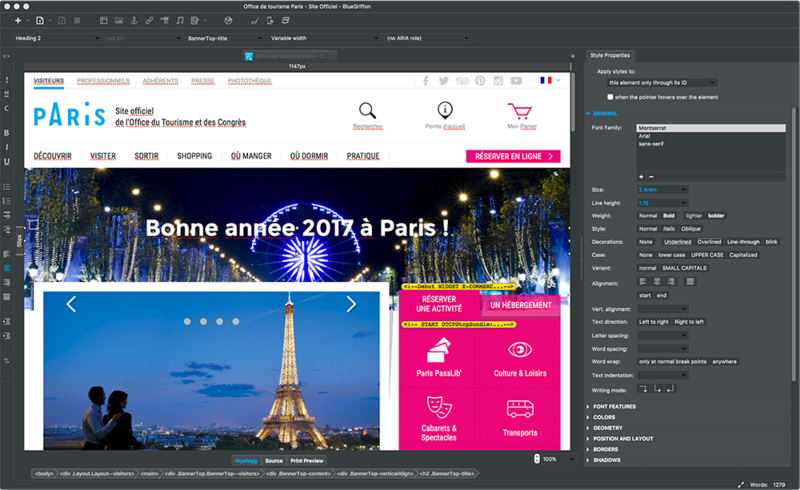 BlueGriffon is a powerful WYSIWYG HTML editor based on Firefox's Gecko engine. Strong standards support means the program can open and edit just about any web page - HTML 4, XHTML 1 and HTML 5 (both HTML and XML serializations) - whether it was created by BlueGriffon, or not. While normally the program works in WYSIWYG mode, you can also freely edit your page source, if you prefer a more hands-on approach. And elsewhere, a custom CSS parser ensures your styles work just as you'd expect on all modern browsers; there's a built-in SVG editor; and the program is available for Windows, Mac and Linux, so it's easy to work on your projects wherever you might be. While the web editor itself is free of charge, there are a number of add-ons available that could quickly bump up the price. If you want to easily create tables using CSS, count the number of words on a page, create thumbnails or use code snippets, extensions are available for a small fee - individually they do not cost much, but the price can soon mount up if you need several. BlueGriffon is a strange mix of very basic and more advanced tools. The tools available may seem limited at first, but even those unversed in code will find that advanced control of page elements is afforded to them through the guided use of CSS3. What's new in 3 (see changelog for more)? - Certainly the most powerful Responsive Design editor of all Wysiwyg editors! A web editor for intermediate coders, BlueGriffon is fairly impressive, but is slightly lacking in features, and the paid-for add-ons reduce appeal somewhat.